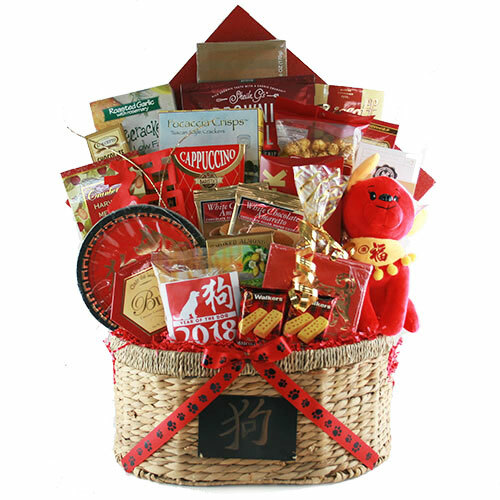 Our unique Corporate Gift Baskets and Business Gifts make exceptional gifts for your special clients, customers, and employees! These custom corporate baskets are also perfect for your business referral gifts, client appreciation gifts, contract closings, realtor gift baskets, and more! Custom corporate baskets designed specifically to your specifications and budget. This can include mixing and matching themes - Coffee and Chocolate for example - or including products not usually available in our inventory. Corporate gifts and gift baskets have virtually no limitations! We’ll shop for, or source, just about anything you need! 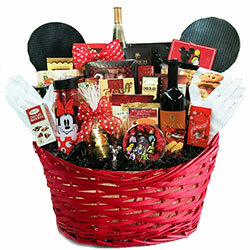 Gift baskets personalized with your company’s own promotional items. This can include company logo items such as coffee mugs, calendars, mouse pads, t-shirts, and pens. 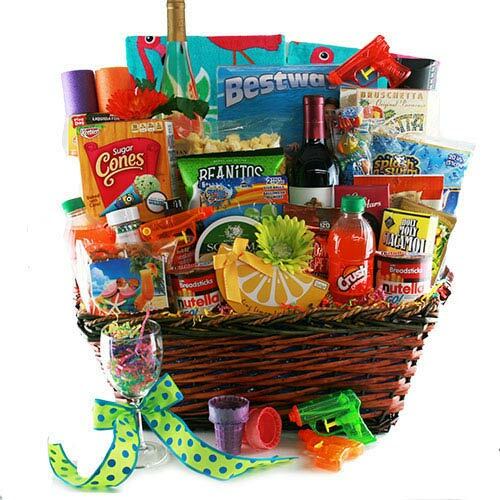 You provide us with the items and we’ll include them in your corporate baskets - free of charge. Don’t have logo items? We can take care of that for you too. Business gifts have never been easier! Gifts personalized with custom imprinting and artwork. We can arrange to custom imprint most of our corporate gifts. This can include foil imprinted ribbon, fire-branded wooden gift boxes, silk screen imprinting, embossed artwork, photo transfers, custom embroidery, and much more! Personalized message to your recipient printed on special occasion note card or greeting card. We include your gift card message WITH the basket, IN THE BOX, just as you would if you shipped it yourself. Contrast this to most of our competitors that slide a piece of paper with your message UNDER THE PACKING SLIP on the outside of the box! Oftentimes, the recipient doesn’t even find it! How impersonable! Volume discounts on your corporate orders. Corporate customers can save money by enrolling in our Corporate Accounts program. The program provides attractive discounts for both large-ticket, single purchases as well as aggregated, on-going, smaller purchases throughout the year. Special considerations and discounts on shipping. Corporate customers enjoy discounted shipping rates, expedited shipping on orders, and special delivery options for gifts delivered in the Houston Metroplex area. Corporate customers can house promotional items in OUR warehouse FREE of charge. Storing your promo items onsite allows you to order gift baskets for your clients or employees and have us include your promo items anytime you place an order. Want to welcome a New-Hire with a gourmet coffee basket and add in a company logo’d mouse pad and coffee cup? Done! 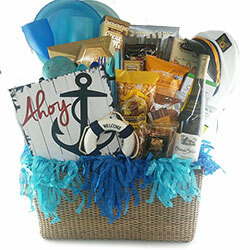 We here at Design It Yourself Gift Baskets believe that creating unique, made-for-the-occasion corporate gift baskets is the key to setting yourself apart from your competitors. Our extensive array of products and ideas will assist in taking your brand to a whole new level. Customization and imagination are what sets those special, unique gifts apart from the off-the-shelf, everyday gifts. Whether you’re looking to impress your customers, "WOW!" perspective clients, or reward your employees, our corporate gift specialists are experts at crafting absolutely amazing gift baskets that are tailored specifically to your needs and budget. And please keep in mind that while we carry an extensive product inventory, if your vision or requirements are such that we need to look beyond our standard product lines, we’ve got you covered. We routinely shop for, and source, specialty products for corporate clients. This includes tirelessly scouring the web for that perfect box of Italian chocolates or shopping locally for an amazing Texas salsa. Because that’s what we do. 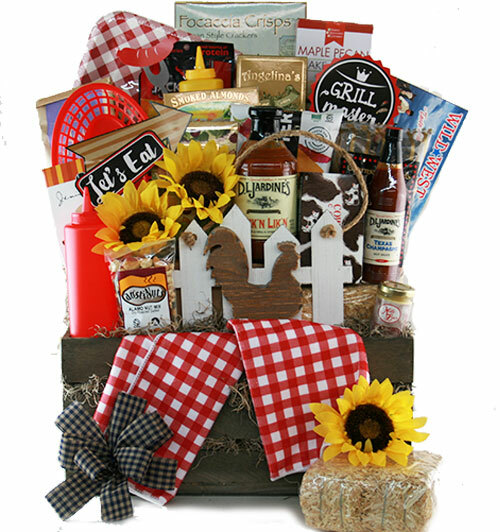 We ARE custom gift baskets, and our gifts are as diverse as your imagination! One of our corporate clients reached out to us to create a unique custom-made, gift basket for an 11 year girl coming to Texas from Mongolia to have heart surgery. Our customer wanted to welcome Sarangoo and her family with a gift basket containing all of Sarangoo’s favorite things: . She absolutely loved TY Beanie Boo’s, coloring books and puzzles. 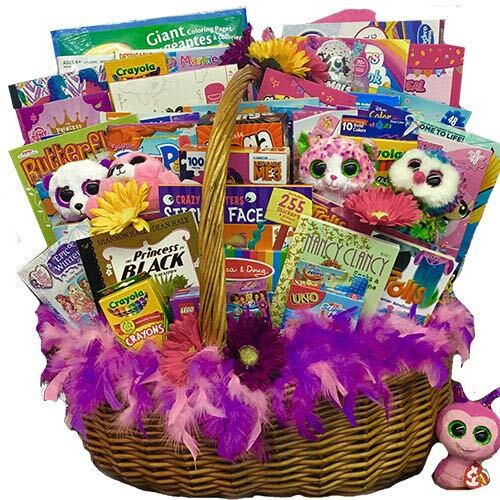 So our gift designers set out to do just that….create an outof this world, larger than life Beanie Boo basket! 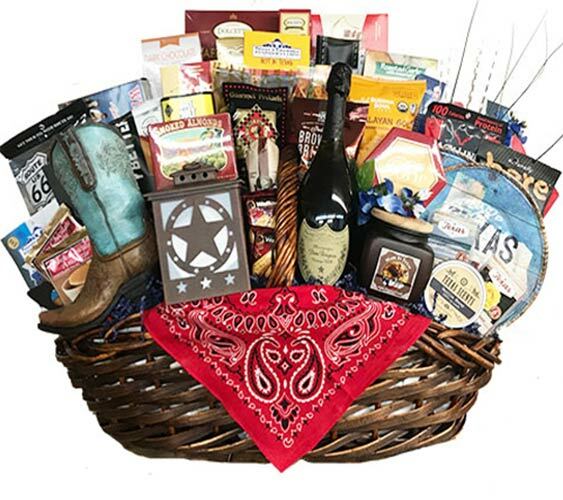 One of our local Houston realtor clients reached out to us to create a grandioso Welcome to Texas gift basket. She had a family moving in from out of state and wanted to be sure they experienced our good ole fashioned hearty Welcome to Texas!. Because all things are BIGGER in Texas, our designers set out to showcase just that. After finding the perfect Texas embellishments and décor, we began to create a one-of-a-kind, custom Texas basket. Needless to say we not only WOWed the family, but the realtor as well! We were contacted by a client to create a Thank You gift basket that incorporated some of her client’s favorite things: Red wine and Mickey Mouse! Suffice it to say, this was definitely going to be a fun gift basket for our designers to create. After some brainstorming, we set out to find the perfect red basket and coordinating gourmet products. We sought out some Disney products to add a little more character to the basket. Now for the final touch - we created Mickey Mouse ears and added white gloves to complete the masterpiece. Did someone say pool party? Why yes, they did! 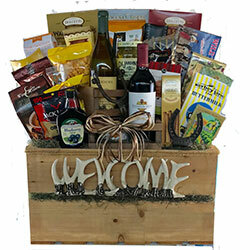 A Title company client asked us to create a Welcome to your New Home, summer gift basket. It was specially designed for a family with kids that had a pool. We couldn’t wait to dive in and start designing this basket. We combined a fun assortment of refreshing summer snacks with a variety of pool necessities including beach towel, pool noodles, beach ball and even water guns. Don’t think we forgot about the parents – they were able to relax poolside with their choice of a nice bottle of chardonnay or merlot while indulging in some savory gourmet snacks. A lot of corporations have company holiday parties. In this particular case, one of our clients was hosting a Casino Night. They reached out to us for an employee give-away gift basket. 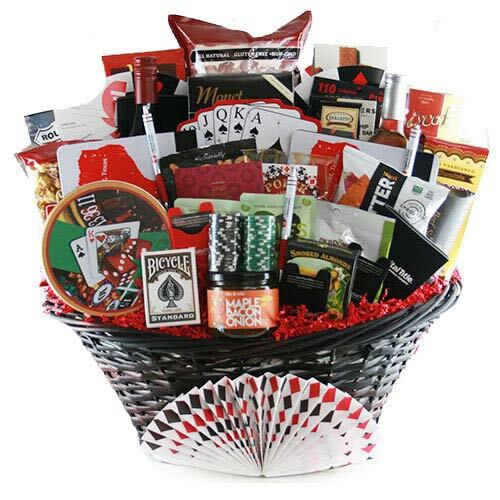 We brainstormed and decided to create a Casino/Wine gift basket that coordinated with their poker and black-jacked themed party. Our designers found the perfect black basket and gathered a variety of gourmet snacks and treats to pair with the red and white wines. From there we shopped for the perfect poker themed embellishments to complete the basket; making the employee who won the basket a big WINNER! Our goal is simple. We want to create meaningful, lasting relationships that "WOW!" not just our clients, but their clients too! Given sufficient notice and budget, we can create almost ANYTHING. 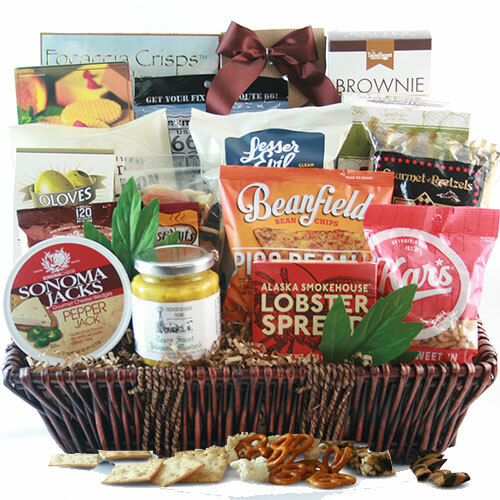 Because anything and everything is possible at Design It Yourself Gift Baskets!